I wonder if every chef remembers the very first recipe they ever created all on their own. I do, and that’s the recipe and cooktale I’m sharing with you today. Pork ‘n Peaches. A classic meat and an essential summer fruit, and not to mention, butter, brown sugar, and roasted pecans. It sounds like a little southern dash of goodness doesn’t it? Well, let me tell ya’ll… IT IS! After about a year of doing nothing but watching Food Network, reading cook books cover to cover, studying recipes as if I had a test on them the next day and following them word by word with every measuring cup and measuring spoon I had in my cabinets, I decided to give up my fear of “a little of this and a dash of that” and boycott following recipes word for word. I mean, I could cook really well when I followed a recipe. It seemed everyone always loved what I cooked, and I had decent enough knowledge of food to give my family and friends tips regularly, so why couldn’t I just start making up my own recipes? A Saturday morning at the farmer’s market and a sack full of peaches later, I walked in the kitchen and just downright went for it. I was scared. But I wanted to do it. I loved to cook, and I loved the challenge of a difficult recipe, so I thought it was time to start getting creative in the kitchen. 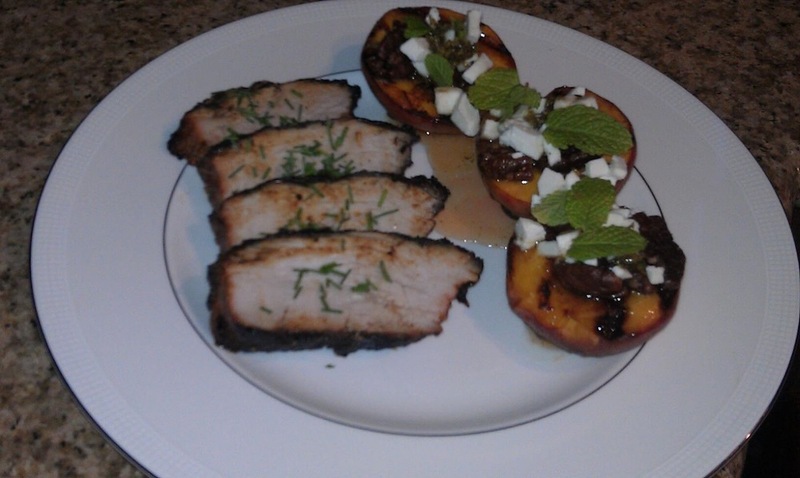 In July 2012, my very own version of Pork ‘n Peaches was created, and that same day, my kitchen confidence went sky high. That was the day I went from “cook” to “chef.” I think this can happen for anyone who loves to cook. Don’t be afraid to get creative by taking ingredients you already have and just go for it! Does it always turn out perfectly? Heck no. But you learn and you move on to the next one. In the meantime, I’m happy for you all to follow my recipes, and hopefully I can teach you something along the way! Start by making the marinade. Combine all the ingredients in a plastic Ziploc bag. Put pork in the bag and make sure it’s covered in the marinade. 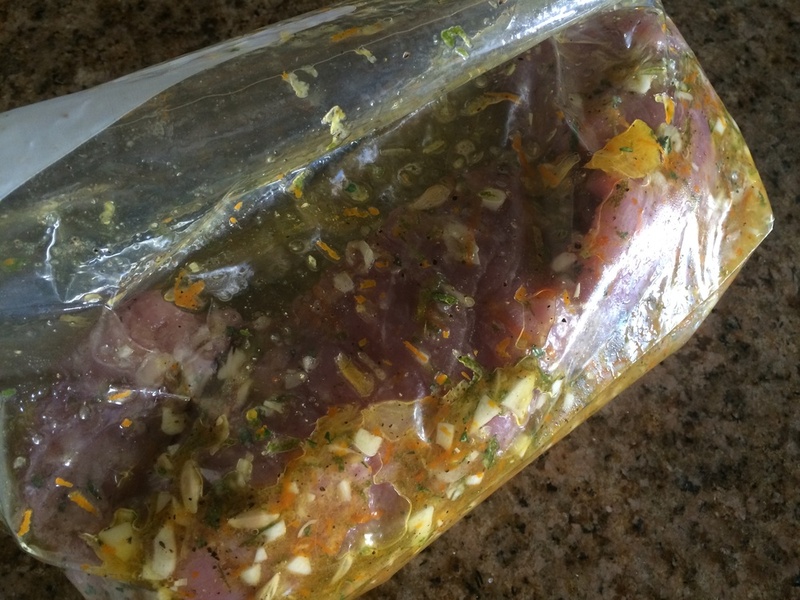 Let the marinated porksit in the fridge for at least an hour or more. Grill on medium heat, turning every 5 minutes (and basting with remaining marinade as you turn) for 30 minutes or until the thickest part of the loin is heated to 155-160 degrees. It can be grilled indoors on a grill pan or on an outdoor grill. I prefer an outdoor grill’s flavor for this dish. 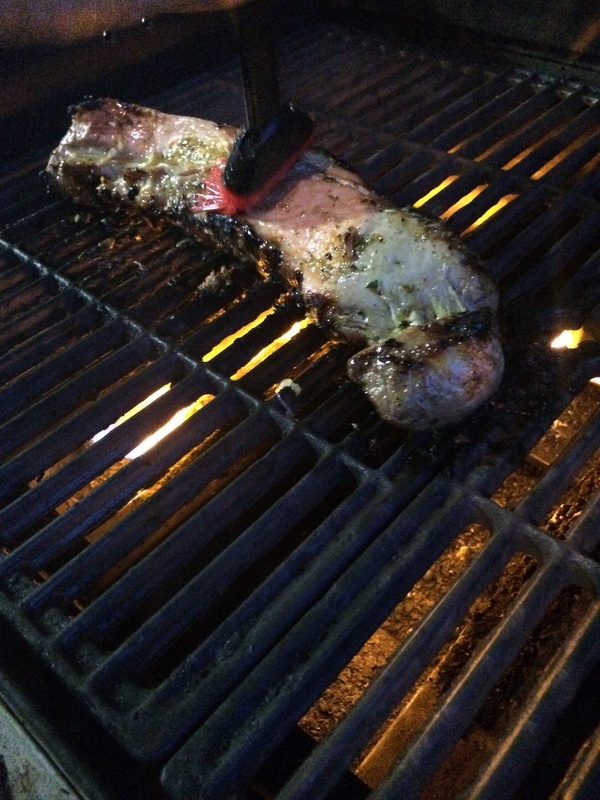 Once the meat is the correct temperature, take off the grill and set aside. Tent the meat with foil and let rest for about 10 minutes. To serve, slice meat in ½ inch pieces at an angle and top with chives for garnish. Serve alongside the peaches. 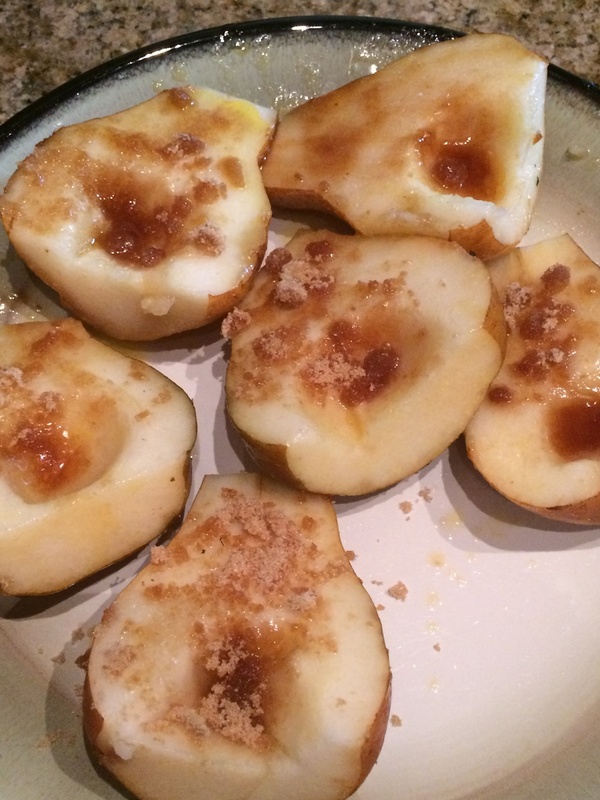 Brush peach (or pear) halves with melted butter, liberally and sprinkle with the brown sugar. Set aside until ready to grill with the pork. Grill for 3 minutes, cut side down. Flip, and grill for 2 more minutes on the other side. 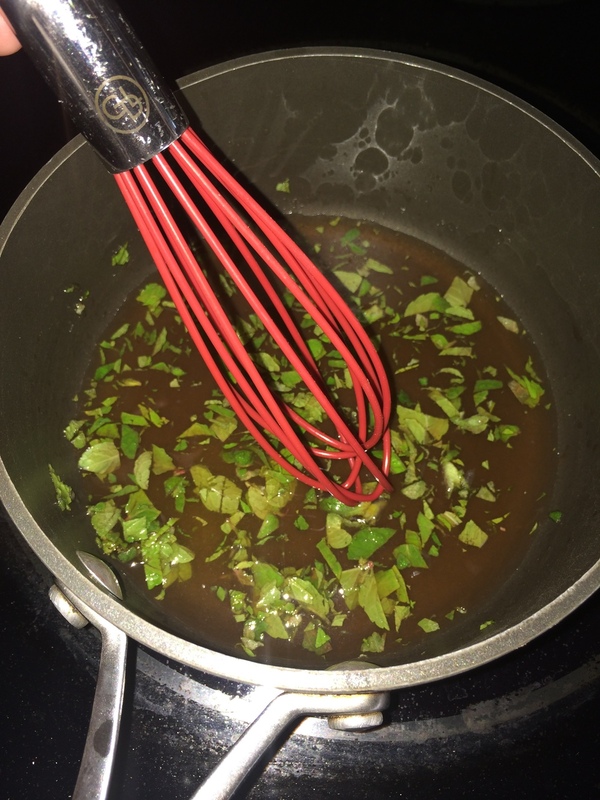 For the dressing: combine the honey, lemon juice, vinegar, and chopped mint in a small sauce pan and whisk. Bring to a boil and let simmer for 5-10 minutes. Take off the heat to thicken. 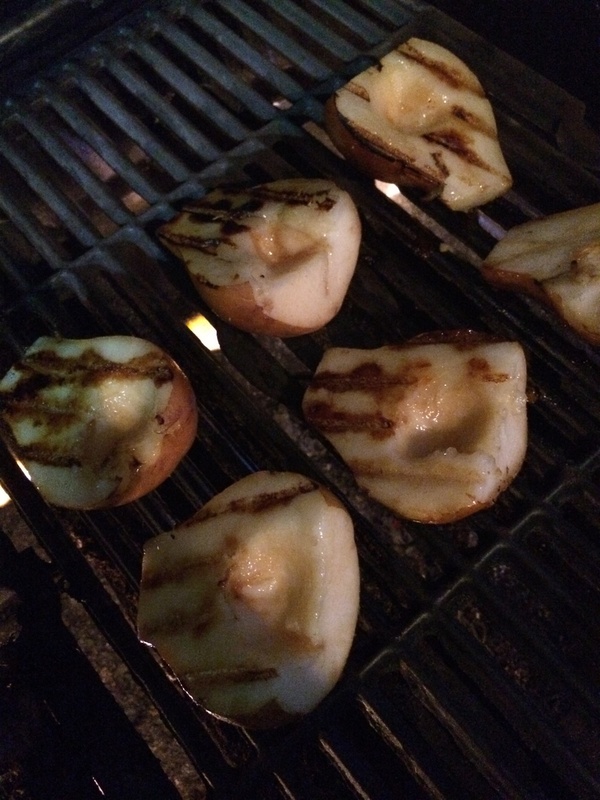 Top grilled peaches (or pears) with dressing, goat cheese crumbles, and pecans. Heat oven to 350. 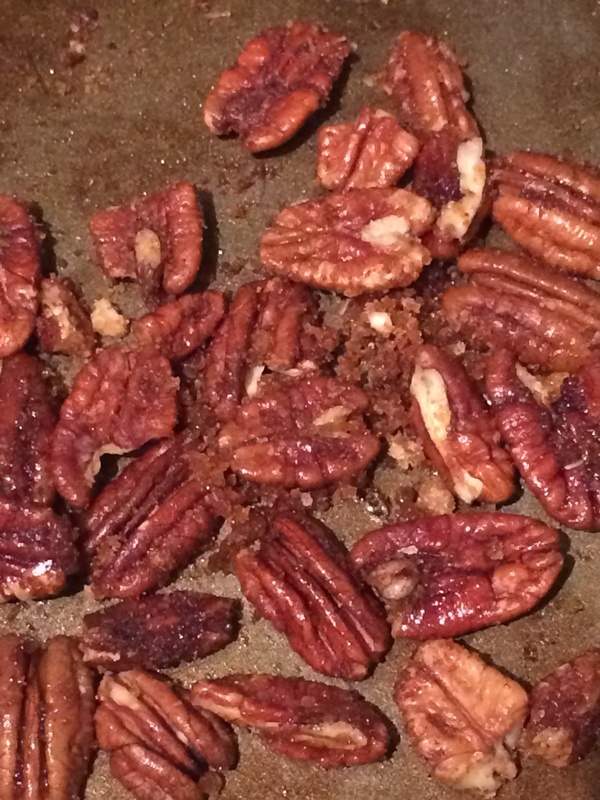 Toss pecans with olive oil, sugar, and spices. Roast for 12-15 minutes.